The LA Based outfit, A NEW REVENGE, featuring an all star line up of classic rock players, will release their debut album, Enemies & Lovers on March 29th, 2019 via Golden Robot Records. A NEW REVENGE is the very definition of a supergroup. One who’s members have more than earned their legendary statuses but also remain humble enough to let the music do the talking and not actually rely on the term. So who is out for A NEW REVENGE? Featuring one of the finest voices in metal of all time, Tim ‘Ripper’ Owens (whose voice is all over albums from JUDAS PRIEST, ICED EARTH and YNGWIE MALMSTEEN), one of the most versatile and name checked guitarists in rock Keri Kelli (SLASH'S SNAKE PIT, ALICE COOPER, VINCE NEIL, NIGHT RANGER and a hundred more), the most iconic bass player in heavy metal history, Rudy Sarzo (who’s work with OZZY OSBOURNE, DIO, WHITESNAKE and many more has earned him an almost revered status in heavy music) and long time SCOPRIONS drummer James Kottak (also from MONTROSE, WARRANT, KINGDOM COME & more). A video for the first single from the album's release, "The Way", can be viewed on KNAC.COM HERE. Due to scheduling conflicts, Sarzo was unable to attend the filming of A NEW REVENGE's videos. The band's good friend and renowned player Phil Soussan (OZZY OSBOURNE, LAST IN LINE) stepped in at the last minute to take his place. A NEW REVENGE is greater than the sum of its’ parts, although its parts are pretty damn mind blowing! 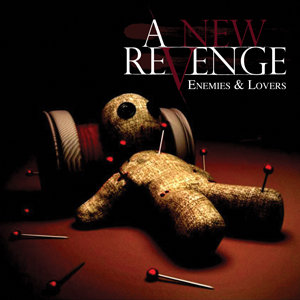 A NEW REVENGE will hit the road across the U.S. in support Enemies & Lovers throughout 2019 and is looking at locking in a European tour later in the year. The foursome is an explosive combination with every band member’s skillset and battle tested charisma breaking through the bleak wasteland of current day modern heavy metal.